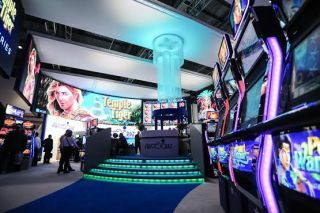 XL Video supplied LED screens for two stands at the 2014 ICE Totally Gaming international business gaming exhibition, which attracted visitor figures from the world of pro gaming for three days at London’s ExCeL Centre, February 4-6. The stands involved were Aristocrat and Microgaming, and the delivery of the LED screens, processing and control was handled by two XL Project Managers, Jacqueline Rice (Aristocrat) and Andy Mayneord (Microgaming). Working for stand designers Expoteam, XL supplied a curved Pixled F-11 screen that formed a back wall to this stand for slot machine and gaming systems specialist Aristocrat’s prominent stand. The screen was 43 tiles wide by 8 tiles high – approximately 19 meters wide by 3.6 high. The back screen was supported by six square banners of 8 x 8 tiles each down each side of the stand. XL also supplied a Catalyst media server for playback of content to all screens, which was created for the client by Paddy Cannon of Pixelkid. The challenge was to create the curve for which XL’s team worked closely with stand Designer Steve Percival. He came up with a suggested radius and XL’s UK and Belgium offices pooled resources to create a practical solution. The exhibition was only in its second year at ExCeL having moved from Earls Court, and this year in particular exhibitors were clearly looking at the scope for expanding the visuality of their stands and taking advantage of the new different environment. XL worked for SSG Create on the booth of Microgaming, supplying a 3.5 by 2 meter Lighthouse X3 screen for the main area with video content played back via a loop running in Keynote on a laptop.